Tesla electric motorhome – Love or hate it? Telsa started with cars, and then pushed out into another market where they saw potential and need: semi transport trucks, and they’re coming close to putting out a powerful, electric-powered, sleek semi tractor that they’ve already shown publicly. RVing is yet another market where Tesla will likely go, given that it’s a large share of the auto industry. Electric RVs, including electric motorhomes, have already been made, but they’re still limited, because you need so much towing/pushing power for the weights involved in RVing vehicles. Some of the forerunners have already entered the market, including the Nissan All-Electric Camper Van, but they are somewhat limited in distance. Tesla seems to be able to push the boundaries as well as anyone, though. So Tesla Motorhomes, but when? The design is by NeoMam Studios: “Tesla’s Model X is a mid-sized, electric, luxury SUV that can handle a bit of off-roading. But with its prototype of an electric semi truck, we feel that the brand could easily expand into camping territory. Solar panels on the roof power the living quarters, keeping it one with its environment. 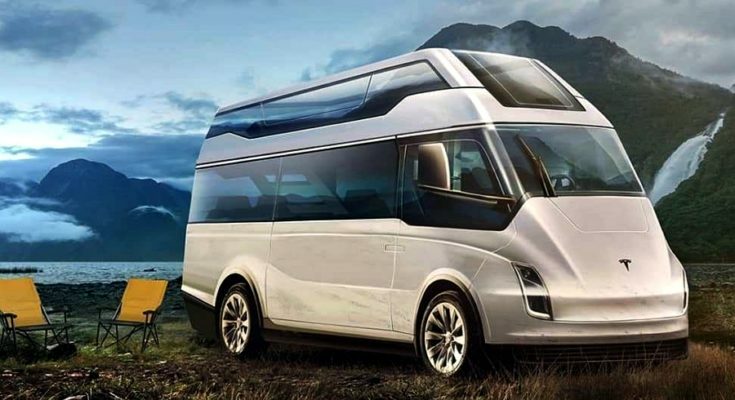 And with sleek lines and plenty of windows, you’ll be able to enjoy all the perks of camping, with all the comforts of home.” The design is based directly off what Tesla has already shown in their semi tractor offering. What do you think of the motorhome design? Love it or hate it?